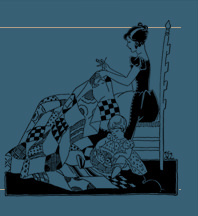 1931 editionof 101 Patchwork Patterns. They had to be ordered directly from McKim Studios. Quilt kits and ready-cut quilts are no longer available, of course. Patterns for (*)noted items are currently available at mckimstudios.com. Keep watch for more items to become available! for your personal reference, they are not to be duplicated for resale.